I wish that moving was my excuse for the lack of blogging, but it's been about two months since this happened! I can tell you a bit about our experience, though. For advice on moving across the country, I found this post helpful. Zack and I were packing up our rooms at our parents' houses, a storage unit, lots of stuff from our parents' garage and basement, and WEDDING GIFTS. We each came at this from different angles and with different attitudes (lessons on marriage. . .). It totally stressed me out to pack from five different places and try to get everything to one place. I think we're about 85% there now. Truthfully, now that I have a well equipped kitchen all to myself to share with Zack, and my clothes live here, I'm pretty content with the move. Unfortunately, Dan didn't go with us that time. He stayed with my parents until a few weeks later, when we returned, rented a UHaul trailer, and made another trip. Actually, both of our pets came with us that time, but that's another story. This guy was my passenger on the 7+ hour drive. I am so thankful that Zack drove the truck! We rented a 26 foot Penske truck, which was the size recommended for 5-7 rooms, and it was the right size for us. We packed most of the furniture we would need for a four bedroom house in that size truck. We've purchased a few things since we moved in, but as you can see, there was some extra room, had we had all of our furniture. Zack did an awesome job piling things up to make sure we had room. He and his dad loaded the furniture. They worked so hard!!! We hired movers on the back end of the move, thank goodness. Homeowners! Newlyweds! Are we crazy?! One of the first things I unpacked were my "snake boots" -- absolute essentials for taking the dog out or for living in a new place with unfamiliar fauna. 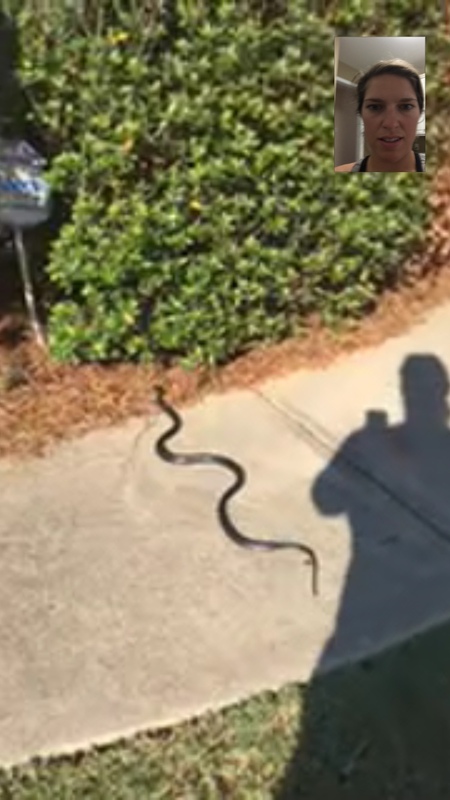 Speaking of which, this is the snake Zack found in our neighborhood. I was at home wondering what was taking him so long when he FaceTimed me to show me THIS. I joke that our house is a mix of antiques, college boys apartment, and sorority house. That 32" TV seemed huge in my college apartment bedroom . . . not so much in our living room. Dan finally got here, but we had to wait a while to get our fence completed. We went back to the days of the "umbilical cord" as I tied him around my waist to do things around the house and yard. After two months in our house, we are still getting settled. Right after our move, people asked me often, "are you all moved in?" or "are you all settled?" and I would usually laugh. It made me feel better when most of them commented "we've been in our house two years and still have boxes," etc. Earlier today I was reading the Bible and meditating, and suddenly, I felt thankful for the process. There are some bare spots, and I don't like many of the plants in our yard, but I'm looking forward to gardening. Many of our things are still in boxes, but we get to decide where we want to put them. There will always be things we need, things to get rid of, things to clean, and things to organize. Living with someone else and making decisions together is a challenge--one that is growing us, as we merge our lives. It's easy to complain that I want things done, but maybe I'm forgetting that the process itself is rewarding. I will have to pray that I remember to enjoy it! Though I'm not rushing, I look forward to having pictures on our walls and a room without boxes, and I do plan to share more of our hand me down style home then.